Green Bay Packers fans had plenty of reason to panic heading into the 2014 season. The team's starting center, JC Tretter, suffered a knee injury that landed him on short-term injured reserve. Next in line would be Corey Linsley, a rookie offensive lineman who had yet to take a live snap with Aaron Rodgers. 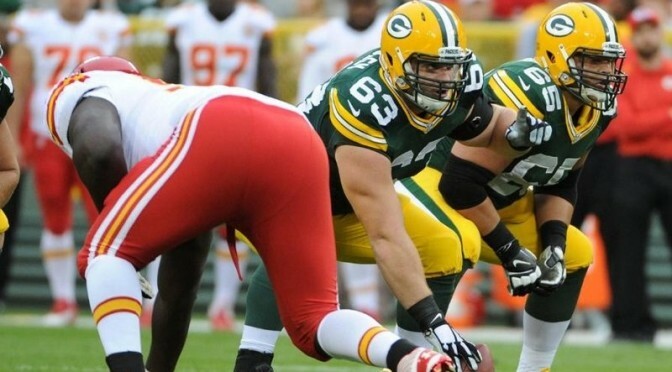 Yet, as Linsley proved over the course of the year, the Packers had little reason to worry. The young center performed at a remarkably high level for a first-year player, let alone one selected with the 161st overall pick. Linsley has since entrenched himself as part of Green Bay's preferred starting offensive line, garnering national recognition for his efforts. He earned an All-Pro vote back in January, becoming the second Packers player to receive votes in as many seasons. Now, Linsley has been named as one of Pro Football Focus' Secret Superstars. As Pro Football Focus notes, Linsley's first season was a trial by fire. His first professional start came against the defending champion Seattle Seahawks and one of the best defenses in the league. While his play during the first quarter of the season proved a little uneven, he steadied soon thereafter, becoming one of the team's most consistent offensive linemen down the stretch. He finished with a grade of +12.0 and ranked third among all centers in pass blocking efficiency. The Packers have Linsley under contract through 2017. The current starting line is signed through 2016.